The Mother's Day Brunch my 4-year-old made for me. I type this surrounded by the following: A bright red construction paper card made by my 11-year-old that says “You are the best mom ever” in both English and Egyptian heiroglyphics, a “calendula plant” (my 7-year-old explains) in a handmade planter with a paper flag set into it that says, “Happy Mothers Day, Moma” (sic) and decorated with designs that look a lot like the tattoos she wants. 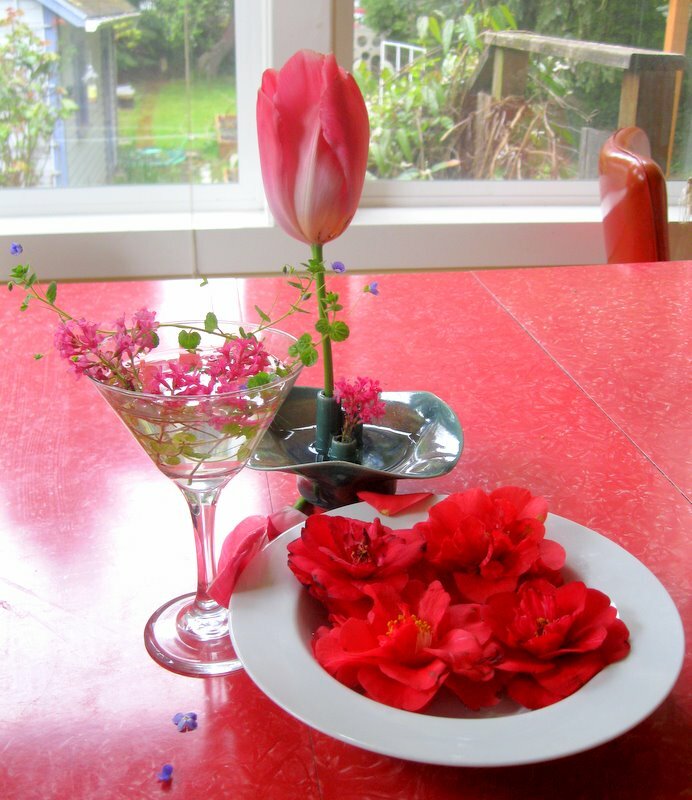 My 4-year-old has made me a “flower breakfast” with camellias and tulips she picked from the yard. I note she’s chosen a martini glass. That’s my girl. Mother’s Day is inspiration for more of the same around here (and I’m not referring to the martini glass, specifically). On the table are also sodden water colors, blue fish being the latest obsession. A cartoonish, supersize bouquet of skinny balloons is jammed into a vase—balloon bending went on under the table until late last night. My oldest is tapping out “Ode to Joy” on the piano, and each note is singular and a surprise. She actually likes practicing. Who knew? My middle girl has made a peanut butter bagel and dropped it face down on the floor by my feet. I should stop to pick it up. However, I am writing, so it can wait. What they don’t tell you about parenting, or maybe they do but nobody really listens to anything about parenting before they are parents (as my own dear mother has reminded me), is that on good days, on the best days, you will be the recipient and facilitator of miniature people’s creative work and, if you can ignore the bagel smooshed three inches from your feet, they will return you the favor and provide you with precious inspiration. Yes, your children will do this for you, these same people who for a good many years you despair will not learn to say all the letters of the alphabet, wipe after going potty, or find the correct words to thank you (just two!) for any number of times you’ve saved them from, well, just about everything. Last night, after said artists were in bed, I was reading Elaine Pagel’s Gnostic Gospels, which is not easy reading after a day with children, but it was closest to my hand when I lay down. I had checked it of out the library because I don’t know much about the Gnostics, except they have a history of irritating a good many religious folk. This morning, while considering the speed with which my daughters create, the ephemeral quality of so much of what they make and yet how complete their absorption and pleasure while they do it, I leafed back to something that had struck me the night before: Some of the Gnostics believed making art is a way of knowing oneself, and to know oneself is to achieve knowledge about the depth of all things. This act of making, those radicals asserted, was to find the Spirit that already inhabited one. It was a terribly simple formula and yet so hard for most people to accept. These expressions need not be elaborate, ritualized creations. They need only be true to what you hear within yourself at that moment. In the card she gave me this morning, my middle daughter wrote, “I love you, Moma” (sic) in dark crayon. She loves to slide up against me, my little bean pole, and for me to whisper that I love her, just as I did a few minutes ago. When I say it, I mean it. From my lips into her ears passes what lies deep in my heart, the gratitude, the adoration, the most basic key to what makes every day worth it. I can’t find better words at these moments, and she does not care. She loves me, too. I know it. She sweated it out over those letters. Two days ago my dad died. My last words to him were: “I love you, Dad.” His answer was, “I love you too, kid.” Both of us uttered the last thing people can think to say when our hearts are burst open. His words, fleeting and beautiful to me, were the embodiment of what it means to adore and let go of what you adore, to hear what you feel within, present it, and know what you manage to bring forth will be received in the spirit with which it was given: Childlike, immediate, and pure. It is very simple, I’m thinking this morning, as I type this. Sad and wonderful and gorgeous and inspiring. Thanks. Oh Tanya, thank you. I’m guessing you got your share of sweet art today, too. 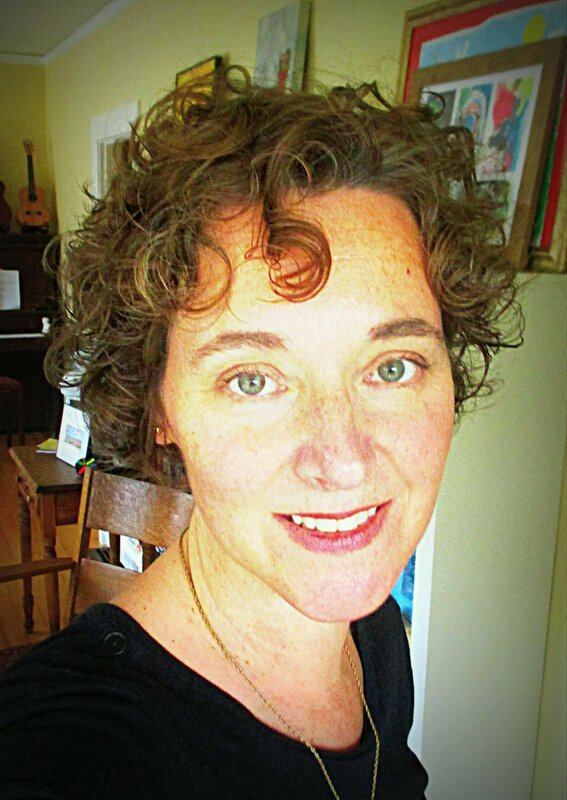 Simply lovely Kathlene…I’m so very sorry for your loss. I received precious artwork from both of my girls yesterday, too. An origami crane from my 9 y/o, as well as “alien standups” made of craft foam, & a “What I Thank You For” homemade book from my 8 y/o…..treasures one & all. Thank you for sharing a broader perspective on these labors of love. Jennifer, perfect gifts from your amazing girls to their amazing mom.